connection to the mobile phone network. You can even listen in with its built in microphone too. features and programming can be controlled via your mobile phone too. Our GSM Camera works with all the major SIM cards and networks including Vodafone. Full remote control by cell phone or management system. Receive SMS, Alarms and Images by cell phone, E-mail or management system. The GSM camera has IR LEDs for night vision and 24 hour monitoring. Mobile Alarm: Capture images and Send to your mobile phone by MMS. SMS Remote Control: Control the camera by sending SMS commands. Real Time audio: Call the camera and listen in. Motion Detection: Detect any motion within the monitoring area and send alarm. sensor, gas sensor etc. The camera can report alarm from all sensors connected. Infrared Light: The built-in IR light enables the camera to capture images in a dark environment. Resolution: 300k pixel CMOS camera. you to watch anywhere, anytime. Receive images by email: The camera can send MMS images to any preset email. Monitoring Methods: Choose between manually or scheduled monitoring. Remote Control: Includes 2 remote controls for manual operation on/off and panic button. Download user manual: Manual can be downloaded anytime using SMS command. 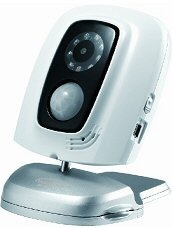 Camera to monitor and protect all sorts of things - not just your home or business. before you decide to have a weekend break. with you your property is protected. our GSM camera will alert you of any boarders. the GSM Camera is that its so portable you can simply remove it from one location and put it in another.